website of the Austin Screenwriters Group. The Austin Screenwriters Group is a resource to serve local screenwriters, providing guidance and support in all areas of the field. We offer networking and marketing opportunities, critical feedback on works-in-progress, and a sense of community for our members. We are open to screenwriters of all levels of experience. Script readings are specifically designed to help our members hone their screenwriting talent. We don't have meetings booked because we don't have a meeting room. ... Let's discuss! Currently on hiatus, so ASG meetings no longer happen. We didn't have great attendance. We only requested a meeting room Jan to June, so let's see if people get inspired. It might take months or something special to get things going. Please email Wendy Wheeler at scripts@wendy-wheeler.com with your loglines, if they're not posted. More details on the ASG requirements are on our Frequently Asked Questions (FAQ) list. May 2018: Only one more meeting (23 June) of the ASG in 2018. Unless someone wants to step up and arrange a spot? Also, we quit specifying only dues-paid members get critique. We're not asking for dues anymore. (They were meant to be spent on our spring workshops and fall producers' get-togethers, but no volunteers have handled these for 4 years.) We're also discussing what to do with the $700 or so in our account. November 2017: We're moving meeting spots. Twin Oaks Library had a free meeting room some Saturdays. I booked them January through June. If you want more northerly or westerly or easterly or central or whatever, please volunteer to help. September 2016: Jill Chamberlain visited again to overview her successful screenwriting technique, as taught in her Austin scriptwriter workshops, which is now covered in her new book from University of Texas press, The Nutshell Technique. Congrats for her on-going success! July 2016: Jill Oleson is looking for someone to step in and volunteer to take over as ASG Treasurer. Many thanks to Jill for her great work. 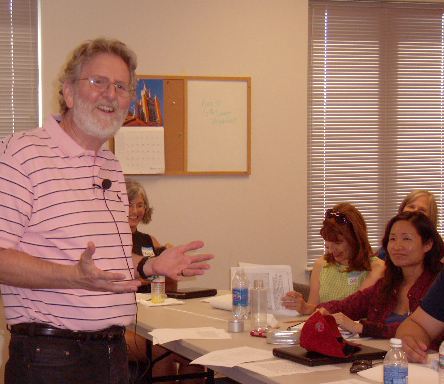 June 2014: Our summer workshop on 21 June on scriptwriting craft went great! Many thanks to Emily McDonald for inviting and organizing TV Script Doctor Sarah McLaughlin for Writing for TV. That's Sarah on the right and Emily on the left... Congrats to Sarah on her new baby (Jan 2015)! June 2012: GREAT workshop with Karl Iglesias! We liked him so much we brought him back again. He surveyed our group for topics we wanted to investigate deeper, so it was a really effective presentation. Many thanks to Jill Oleson for coordinating and wrangling, Tracy Boyd for handling all the registrations and inquiries, Karen Cupp for finding us a large, wonderful space at the Goodwill Community Center, and Angela Lee for locating a lovely home (Dr. Bill Milner's) to have our party in. My role this year was doing the notices and communications and craft services. August 2011: We had a great workshop with author, script consultant and UCLA screenwriting instructor Karl Iglesias. He focused on lessons from his wonderful book, Writing for Emotional Impact. Plus he made himself available for dinners and lunches, and did one-on-one consultations most of Sunday. He was impressed with our group too! Thanks to the many people who chased down projectors and venues, collected money and brought coffee, etc. Especially to Karen Cupp who handled all the registration! October 2010 : An amazing evening with Franklin Leonard, Director of Development at Universal Pictures and co-founder of The Black List. Nancy Smith (First Look Scripts) worked with Maya Perez at the Austin Film Festival to help us find a wonderful guest for the group who could also work the AFF panels and roundtables. Franklin met with ASG and listened to pitches, gave very helpful notes. Our event location, food and details were coordinated by Kathy Alberts. Great job, everybody! December 2009: Jill Oleson created a page on YouTube to collect and display works by and with and associated with Austin Screenwriters Group members. Saturdays are from 10:00 a.m. until 1:00 p.m.
You'll get a confirming email from the listserver at YahooGroups. Just follow the instructions (usually, it just asks you to respond and be sure to type at least a quick message to prove you're not spambot), and you should be on the list for the moderator to approve you. Sorry it's not one-step, but it's an anti-spam precaution. Once you get the message from Yahoo saying the moderator has approved you, you're registered on the listserver software and can then send emails easily to everyone on the ASG list by addressing them to: austinscreenwriters@yahoogroups.com. The FAQ list is on another page, and contains instructions on signing up for a reading, preparing your script for the reading, conducting the reading, and the feedback session. We suggest you visit the page and print it out. You can also get a copy of the information if you download a copy of the ASG brochure as a Word document, click here for that. We keep a list of helpful writing and screenwriting books on another page. How to format a script? It's a question at the top of the mind of many beginning writers. Here's a good discussion with samples written by a fan of Austin (he comes regularly to the Heart of Film Conference) Greg Beal, who coodinates the prestigious Nicholl Fellowship. Writers Guild of America is the group that lobbies and negotiates on behalf of American screenwriters. It's also the place to register your scripts for protection, and if you live in Texas you should use the WGAw (West). The U.S. Patent Office issues copyrights for more-formal protection. Most of the screenwriting contests require that your script submissions be registered, in fact. MovieBytes is another useful site which also features a listing of the many screenwriting contests each year, along with their open and closing dates, as well as other information. The ASG enjoys a very close relationship with the Austin Film Festival and Conference. What an awesome opportunity for education and networking they provide for local screenwriters! Originally called the Heart of Film, it was the first screenwriter-specific conference (now it has many imitators). It's a can't-miss event that happens in Austin each fall. Many of us submit scripts to the Heart of Film competition. Many of us also volunteer to be HoF readers each year--be looking for announcements on that to come from the HoF folks each spring. And the AFF provides other wonderful cinema-related events throughout the year. The contents and graphics of this website are © 2001-2018 by the Austin Screenwriters Group. Please don't copy without permission. All other trademarks and service marks are acknowledged. If you are a paid member of the ASG, you may copy the ASG logo at the top of the page to display on your own website. For any problems with this website, contact the volunteer webmaster. Last revised on 2018-07-05.